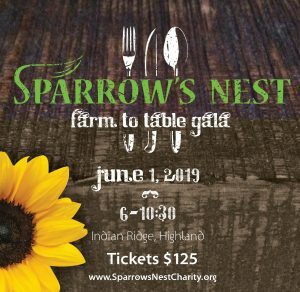 Our new Farm-To-Table Gala was a huge success, bringing in over $70,000 and adding to the list of Sparrows Nest events, including Rock the Nest, Golf Tournament, Super Hero Family Fun Day, 80’s Dance Party and for the first time, Breakfast With Santa. We’ve had great response to all of our events where they’ve each sold out within the first week of being open to the public. Since Sparrow’s Nest commenced, we have fed over 1,500 people and now have 30 volunteer drivers and 15 volunteer kitchen crew to help us each week deliver meals to approximately 75 families. Sparrow’s Nest instituted a new supplemental food program to help recipients and provide additional meals for their families each week. The services we provide, were also made possible by community involvement where we thrive and are fortunate enough to deliver Easter Baskets to our families, Back to School Backpacks for the children, Halloween Gift Bags, Thanksgiving and Holiday Meals, Christmas Trees and more. The wonderful work we were able to accomplish in 2018 is a direct result of the beautiful hearts of people like you. We are forever grateful to the financial contributions you have made, the time you’ve given and the support you continue to offer to our charity. May God bless you this holiday season and in the New Year. Mmmmmm…smell that? It’s the irresistible smell of warm pie, just like grandma used to make! Your “Year-End Giving” makes a difference — whether a monetary donation or a Corporate Sponsorship — so maximize it with Sparrow’s Nest!